I was born in Wales, and moved to Sierra Leone in West Africa at the tender age of 3, and spent 5 years there while my father was in the British Army. After moving back to England for a short period, we emigrated to Australia in 1961, where I have lived ever since. Now 60 years young, I have been involved with motorbikes since I was 15, when I left home and moved into a flat in Brisbane with a friend who was a keen beginner rider. He bought a 305cc Honda Dream, and we both learned to ride on it. 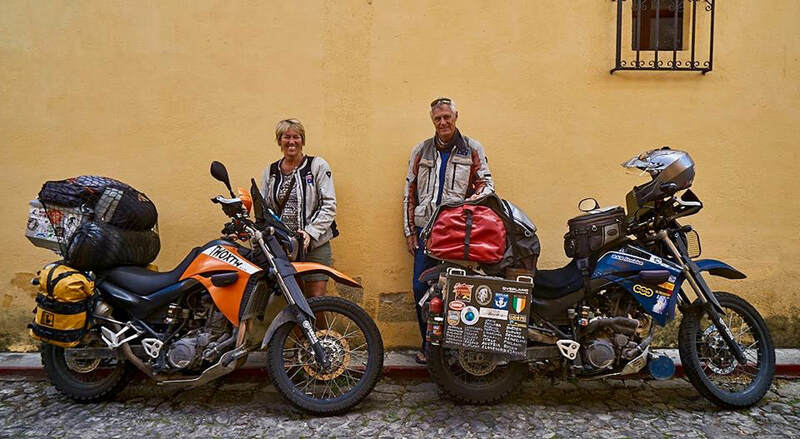 Now, just a few years and thirty something bikes later, I have the chance to do something I have thought about for a number of years, ride around the world. It started out as an idea to ride back to the UK to meet some of my relations that I have heard about but never met, and grew from there to riding all the way around. I have ridden around most of Australia, from the tip of Cape York to Tasmania, and Darwin to Adelaide, all but the West coast, which we intend to do on the way back. I have 2 sons, now both grown up with families of their own, who both have had a short involvement with bikes, both road and dirt, but with young families, are going through the normal break that most of us go through. I have been involved in machinery for most of my life, learning mechanics in the Australian Army as a teenager, then working in the forklift industry for 17 years, first as a mechanic, then selling them. From there I moved to construction machinery, and have been involved in that industry since my retirement. Born and raised in Melbourne, Victoria. Moved to Bendigo after a small stint in the Army, married , 2 children Ashley and Crystal but always had a passion to live on the coast of Queensland. Finally I along with my children achieved this dream in my late 40’s. I have been involved with motorbikes from the age of 15, riding a friends 125 Honda road bike around the paddocks to moving on to Dirt bikes then finally onto road bikes. I have owned lots of bikes from Vt 250’s , St 1100 , Yamaha V-Star to my beloved Harley 2008 Softail, and now my Yamaha XT 660 that will take me into my next chapter of life , to ride the world. Having ridden most of Australia , the bug is in my system and will probably never leave. Jobs I have had many and varied but retirement sounds a hell of a lot better. If you want a safe and secure life, you can live in your lane, BUT whats the fun in that.